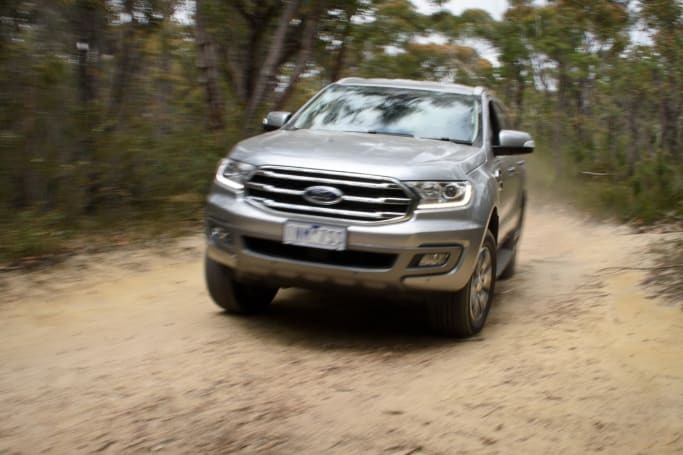 Like any successful product, the Ford Everest has its fans and its haters. And the introduction of the 2.0-litre twin-turbo option to the range appeared to enrage those who take against smaller-capacity engines, a lot of them on principle only. Well, we want to see if any of that engine-bashing outrage is actually justified. We’ve had the mid-spec Everest, the Trend, with the 2.0-litre 'Bi-Turbo' four-cylinder diesel engine, on an extended test for a month or so now. The Trend is typically the line-up's volume seller and you can still get it with a 3.2-litre five-cylinder turbo-diesel engine, but we were keen to see how the 2.0-litre would cope with a substantial chunk of off-roading and towing over different terrain. The Trend is a seven-seater as standard. Pricing for our tester – the 4WD Bi-Turbo variant – is $61,190 (excluding on-road costs). If you go for the 4WD 3.2-litre option, it’ll cost you $59,990. In terms of safety tech, new stuff includes ‘Inter-Urban Autonomous Emergency Braking' (AEB) with 'Pedestrian Detection' and 'Vehicle Detection’, which is all now standard across the Trend and Titanium. Also, keyless entry and push-button start are now standard across the range, and Trend and Titanium get Ford’s hands-free power tailgate. Other standard features include a reversing camera, rear parking sensors, Ford's 'SYNC 3' multimedia system with Apple CarPlay and Android Auto, an 8.0-inch full-colour touchscreen and 10-speaker audio. The 2019 Trend has leather-accented seat trim, eight-way power driver's seat and a leather-trimmed gear shifter. The Trend does not have Active Park Assist (Semi-Auto Parallel Park Assist), Blind Spot Monitoring System with Cross-traffic Alert, or a Tyre Pressure Monitoring System. Our Trend does have the $1000 optional tow pack (including tow bar, LED-compatible module, wiring and tow ball); the Titanium is tow-ready as standard. The bi-turbo engine – producing 157kW at 3750rpm and 500Nm from 1750-2000rpm – is paired with a 10-speed torque-converter automatic transmission. This Trend has full-time 4WD with low-range gearing ('4x4 Low') and electronic diff lock, as well as a 'Terrain Management System' which includes four driving modes (Normal, Grass/Gravel/Snow, Sand and Rock). The Everest is a nice SUV to look at; it has that generic blocky-with-rounded-edges shape of a lot of modern SUVs, which is simply fine, but it does also have plenty of presence. I like its looks but I know a few people who don’t. Styling tweaks for MY19 include a new grille design, revised bumper and fascia design. The interior remains neat and easy on the eyes – the chrome and leather accents are nice – and, for the tactile-focussed folks among us, there are plenty of soft-touch surfaces. The Trend has 18-inch alloy wheels. Inside the Trend is spacious and user friendly; it’s a comfortable, well-managed balance of room enough for long stints of comfortable travel and space that has been maximised space, with multiple storage solutions. The cabin’s overall atmosphere of a high-quality yet functional area is bolstered by its easy-to-read instrument displays, a clear, bright Sync3 screen, as well as nice touches, such as the illuminated blue edging around USB ports (yep, I always mention these in an Everest review – that’s because I like them). The electrically-adjustable front seats are very comfortable. Those in the front have access to two 12-volt sockets and two USB ports, as well as storage spaces which include glove box, two cupholders, and a deep bin between driver and front passenger, plus bottle holders in each door. Second-row passengers get a pair of pop-out cupholders in the arm-rest, and can control their own air con temp and fan speed, as well as open or close their air vents, and use a 230-volt or 12-volt socket from their seat. The second-row has a 60/40 split-fold seat back; third-row has a 50/50 split-fold. There are five child seat anchor points, with two ISOIX anchors in the second row. Third-row seats in the Trend can be manually deployed or stowed away by. 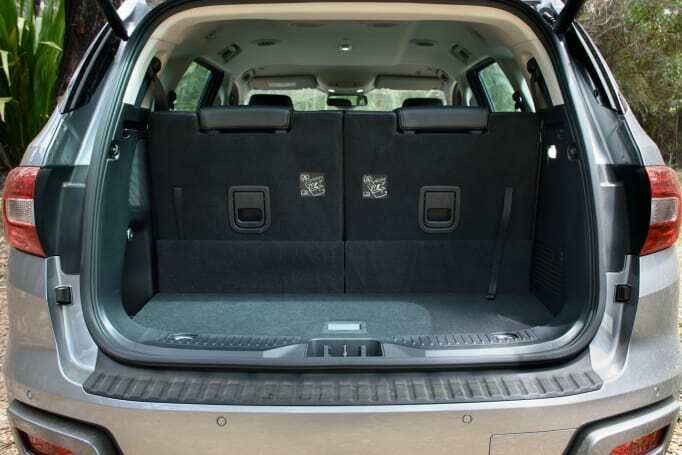 The cargo area (450 litres of space with all seat rows in use) has bag hooks each side, as well as luggage tie-down points on the floor. The 4WD version of the Trend has a claimed kerb weight of 2387kg (the Titanium is 2446kg), but it always feels nimble, more so than most, if not all, of its direct rivals. For all the hate from 2.0-litre naysayers, the engine continues to prove itself as more than capable of consistently delivering smooth power and torque at low and high speeds. I’ve previously described it as “unfussed” and “low-key”, but “effective” – and those adjectives still apply. Sure, the engine doesn’t feel a great deal punchier than the 3.2-litre when you put your right foot down – and it's somewhat lacking a 3.2-like growl – but it does its job well, moving the Everest along safely and smoothly at a fair clip. NVH levels are on the right side of good; the 3.2-litre has always been pretty quiet but there’s a real subdued hush about the 2.0-litre’s cabin. Steering remains precise, light and lively, but is only height-adjustable not reach-adjustable. The Everest's tweaked coil-spring suspension makes for a very smooth ride – with a real stable, sure-footed compliance – and handling. It’s on Bridgestone Dueler H/T 684II (265/60R 18 110T) tyres, which help to produce a less-firm, more agreeable ride than the too-stiff ride we most recently experienced in the Titanium, which was on that variant's standard 20-inch rims and Goodyear EfficientGrip SUV rubber. We’ve been driving it hard from the get-go and it’s never been flustered. Some understeer creeps in around sweeping bends but, for a big, high-riding SUV, it usually feels well-settled on the road, whether that surface is bitumen or loose back-country gravel. 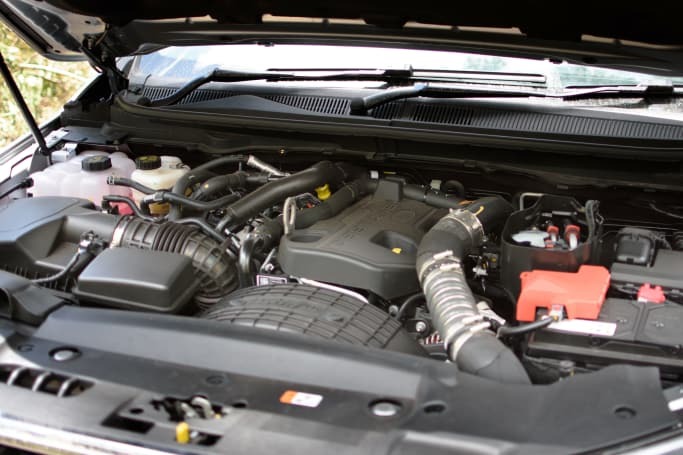 The 2.0-litre engine has not hindered the Everest’s ability to tackle off-roading duties. 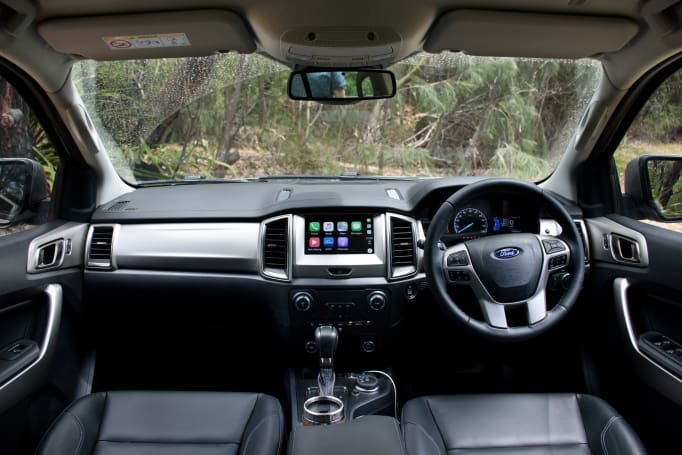 The Trend has full-time 4WD (with low-range gearing and electronic diff lock) and Ford’s proven 'Terrain Management System' which has Normal, Grass/Gravel/Snow, Sand and Rock dial-selectable driving modes. We recently took the 2.0-litre Titanium on a bush trip into Brindabella National Park, considered by some to be tough even for modified 4WDs, and the Everest did everything asked of it – steep rocky climbs, mud holes and more – with no fuss at all. And we were on road-biased tyres. The Trend has 227mm ground clearance, but its underslung full-sized spare tyre eats into that measurement a bit, especially when you’re driving through short steep-angled rocky climbs. The Everest has a listed maximum wading depth of 800mm. 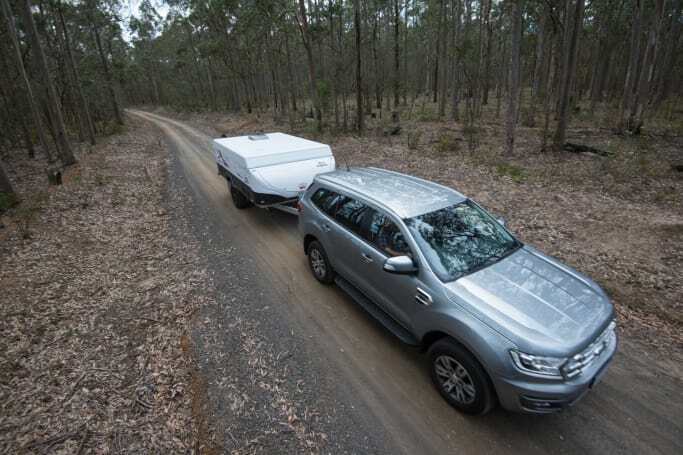 We don’t doubt the Everest’s ability to handle off-roading – but we have wanted to get a clear idea of how it goes with towing, so we took the Trend out bush on two separate towing missions with two different camper-trailers. The Trend has a towing capacity of 3100kg (braked); unbraked max is 750kg. The Trend has a payload of 713kg, a GVM (gross vehicle mass) of 3100kg and a 5900kg (gross combined mass, including braked trailer). It has trailer sway control as standard. On one day trip we took a Jayco Hawk Outback. This is a 5060mm-long (including drawbar), 1910mm-high, 2240mm-wide, single-axle camper. It has a tare weight of 1285kg and 145kg towball download, so obviously it’s not a behemoth like the 2880kg Avida Topaz Multi Terrain caravan we took on our dual-cab ute comparison, but it yields a great impression of what a lot of recreational towers will haul with their Everest on their weekend adventures. We did decent stretches of highway, country back-roads as well as dirt and gravel tracks, some of it deeply rutted in places, with no strife. 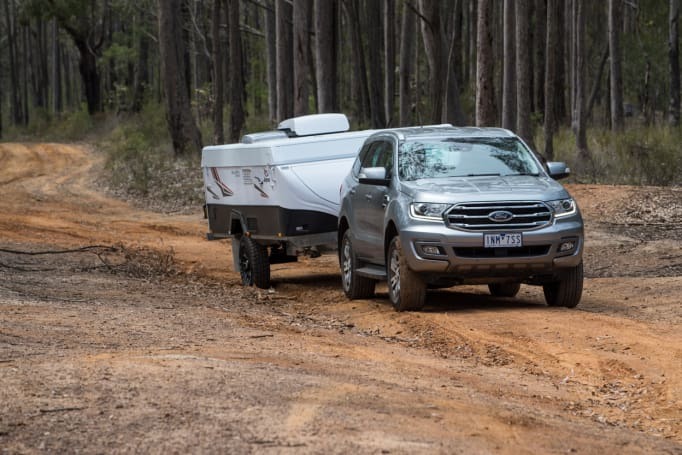 The 2.0-litre twin-turbo Trend smoothly powered the combined load up any inclines, gradual or otherwise, and always felt sure and stable, handling the camper-trailer as if it wasn’t even there. Overtaking moves – even those requiring short sharp bursts of speed on steeper sections of road – were also easily accomplished. On another trip, we took a Jayco Swan Outback out bush. This camper is a 1385kg, 5365mm-long, 2240mm-wide and 1910mm-high single-axle unit with a 130kg towball weight. It’s 100kg heavier than the Hawk Outback, but again it barely registered behind the Trend as we traversed the same road surfaces and terrain as on the other camper-trailer trip. 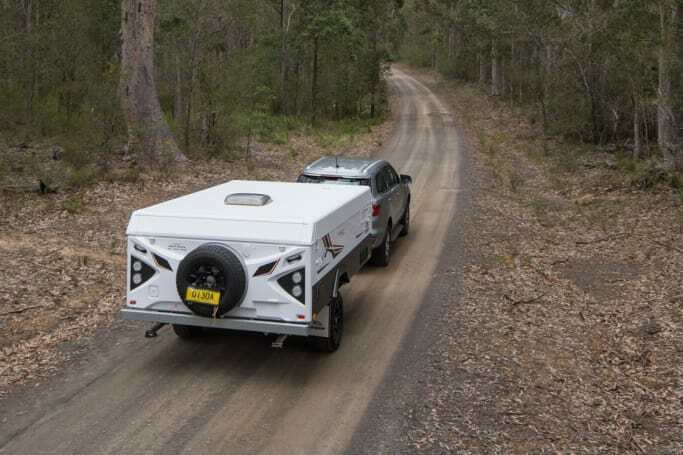 So, while neither camper-trailer was gigantic in terms of size or weight, each of them provided a clear indication of how the Everest goes with a trailer at the back over a variety of terrain. In general terms, standard road-biased tyres remain a rare Everest weak point; if you’re planning any 4WDing, get rid of the H/T rubber and replace with all-terrain tyres. Fuel consumption is listed as 7.1L/100km (combined) in the Trend 4WD. 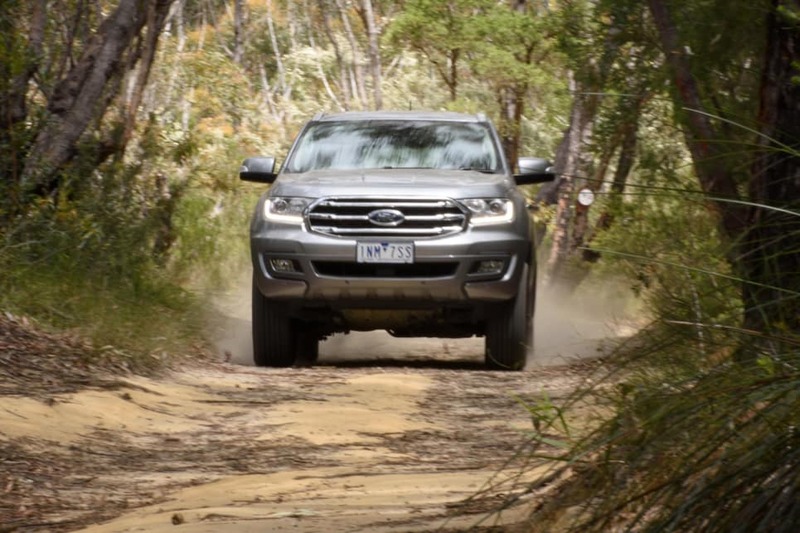 We recorded 9.8L/100km over 200km of general driving (bitumen and dirt roads) with some off-roading. We then recorded 11.2L/100km after 200km, including towing those two different camper-trailers on two separate days, with off-road towing thrown into the mix as well. The Everest has an 80-litre fuel tank. All variants have a maximum five-star ANCAP safety rating from testing conducted in 2015. Standard safety gear across the range includes seven airbags (driver and front passenger, side front, side curtain - to third row - and driver's knee), ABS, DSC, RSC, EBD, traction control, EBA, reversing camera and rear parking sensors. Safety tech includes AEB with vehicle and pedestrian detection, trailer sway control and hill start assist. It has five child-seat anchor points and two ISOFIX anchors in the second row. 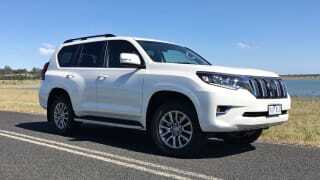 The Everest has a five-year/unlimited kilometre warranty. Servicing is recommended every 12 months/15,000km, with costs averaging out to $460 per service for the first five years. Are there lingering doubts over the new twin-turbo Everest’s long-term durability and reliability if it’s frequently used as a heavy hauler? Sure, but let’s give it the benefit of the doubt and see how it actually pans out rather than make any outrage-based assumptions or jump to any conclusions. 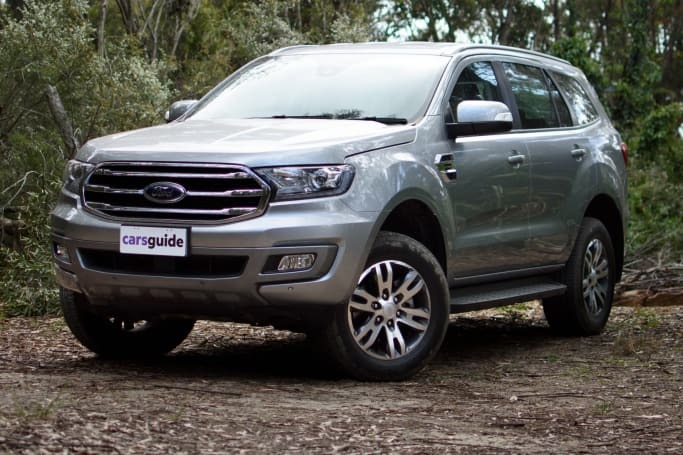 The Everest is one of the best large SUVs around, the Trend remains the line-up's top drawcard and the Bi-Turbo version is certainly appealing – but there’s always the 3.2-litre five-cylinder option for you if the smaller capacity engine doesn't float your boat. Is Bi-Turbo worth the wait, or worth your hate? Tell us what you think in the comments section below. Think of Jeep and images of military-grade off-roaders come to mind. 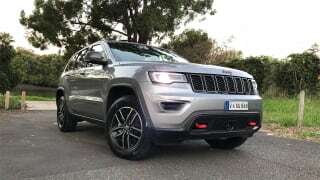 But somehow, the flagship Grand Cherokee had missed out on Jeep's tough 'trail-rated' treatment. Until now.